Designer, high output LED strip lighting made to order | Holly Solar Products, LLC. LED strip - high CRI LED strip lighting for general and accent lighting. Our LED strips bring innovation and craftsmanship to specialized lighting applications. 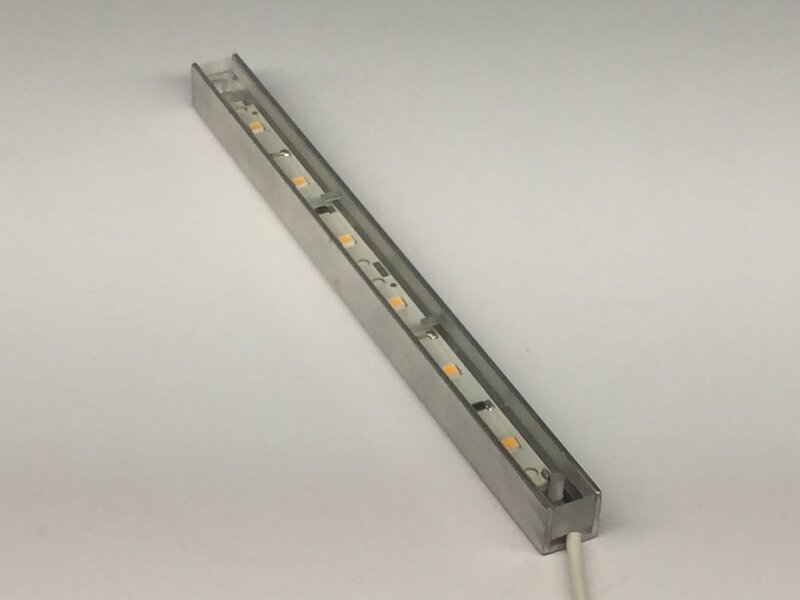 Available in custom lengths, our LED strips can be packaged in an array of complimentary housings, from raw to finished, in addition to low power through hole or mid to high power surface mount LEDs options. Our LED strips provide superior and consistent light dispersion for applications such as: above and below cabinetry, below or behind shelving, for art and/or display, within cove, soffet or crown molding, and for use with surface and/or wall washing. Our LED strips are rated for both indoor and outdoor use and can be hydrophobically coated for submersible applications. Exterior LED strips work effectively in outdoor applications, such as: under rail, deck stairway, point of reference lighting and illuminating signage while maintaining Dark Sky compliance. Made to order, these are high quality, solid state LED fixtures, manufactured by hand within the United States, using the finest and most current LEDs from Nichia America Corporation.